You will know us by our carrier bags and scissors, our bottoms in the air as we bend low beside forest-lined riverbanks and reach deep into thorny hedgerows, sniffing and snipping. We are the foragers, and it is our time – of year, that is. Yep, it is the start of the Great British freebie-athon known as foraging season. First in line to be picked is wild garlic. Looking a bit like lily of the valley (which is poisonous) but smelling distinctly and unmistakably of garlic you can now find Allium ursinum (wild garlic/bear garlic/ransoms) under the broad-leafed trees that line streams and rivers all over Britain. 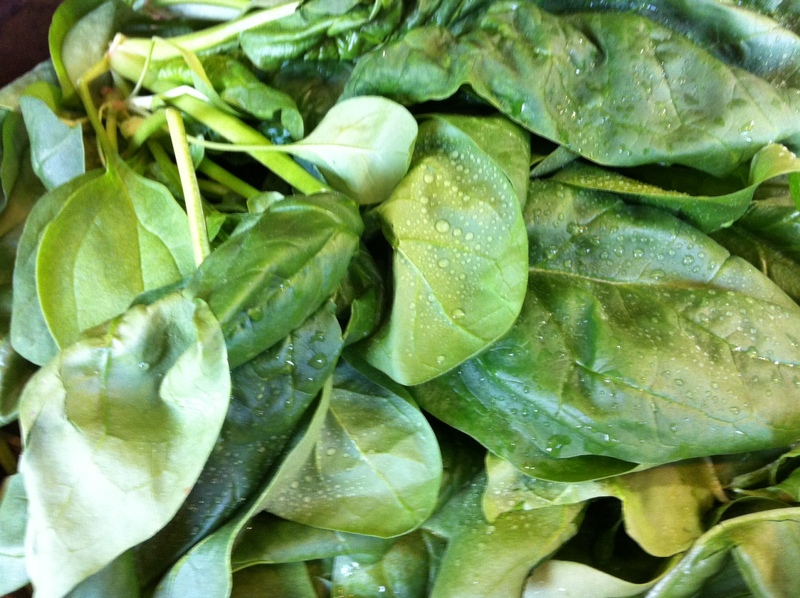 Although it is free to pick, if you buy the pungent leaves in a greengrocer’s or market expect to pay quite a price. So don’t. 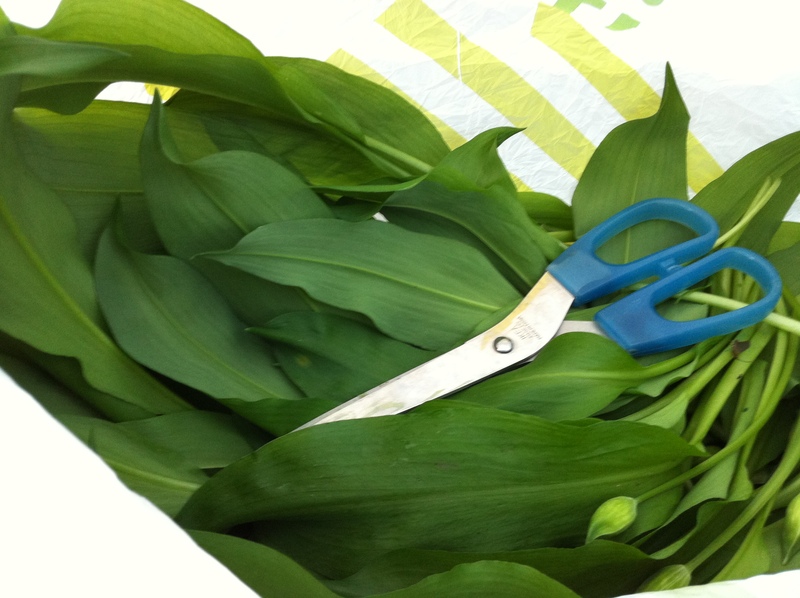 Wild garlic season is short but potentially very rewarding for those who bravely take up the carrier bag. The long sword-like green leaves appear from late March to the end of April, with both the leaves, stems and teeny tiny bulbs all being edible. The leaves, a more delicately flavoured version of cultivated garlic, can be used in place of garlic, with the great advantage that it doesn’t cause offensive breath: the odour-causing sulfur binds with a unique protein, thus neutralising the smell. Potentially revolutionary when you think of the fear garlic holds for the young, free and single (us marrieds don’t care). Try it in soups, stews, fried up and stirred into mashed potatoes or polenta, in omelettes and dips – the flavour is more mellow than the smell. You can use the shoots and buds as you would chives, or cut a bunch into long pieces and stir-fry with Chinese flavourings of ginger and soy sauce. You can probably think of many uses. Once the plants are topped with delicate white star shaped flowers the season is officially over. After a long, extremely cold winter what got me thinking of foraging once again was a purposeful riverwalk in an urban area of Edinburgh. Two weeks ago as part of her Duke of Edinburgh charity work Miss R and I were doing a clean-up with the Water of Leith Conservation Trust on a stretch of water by Saughton, just next to Bookers. 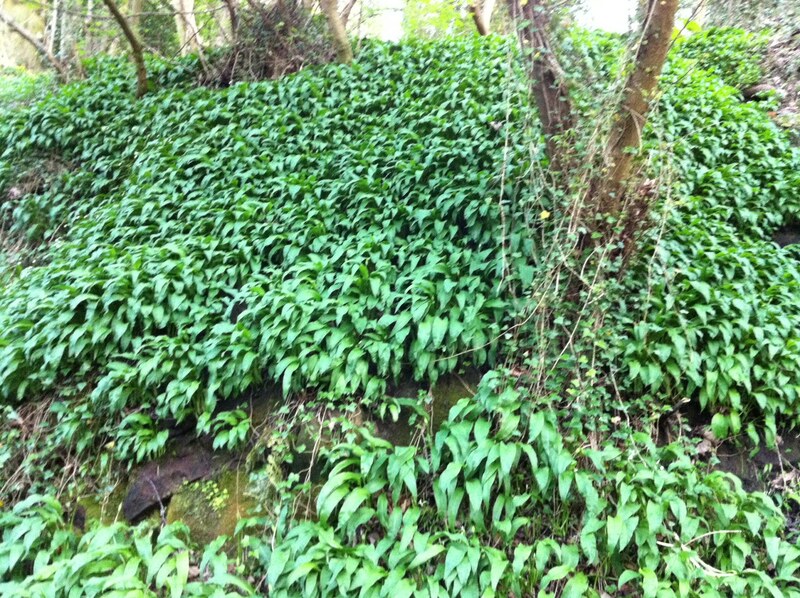 Amongst the dispiriting sight of flyblown and dropped rubbish was a glorious deep green, sun-dappled carpet of wild garlic. It was all I could do not to down tools and gather up armfuls of whiffy loot, but I made a mental note to revisit before they began to bloom. In the end I actually did my foraging much closer to home, one mile away along the beautiful River Almond. On the pretense of a post-prandial walk I conned the family into accompanying me to the densely forested stretch down from the old Cramond post office, the bit before you get to the picturesque riverside village of Cramond. I was quizzed by several curious folk and felt strangely pleased to tell them what I was doing and what I would do with it. I’m sure many more sniggered at the sight of me climbing up the precarious slopes, away from the dog-trodden path, snipping and stuffing, but I didn’t care. Perhaps this is a ‘sport’ for the less-young who don’t feel the need to be cool. But what could be cooler than getting something useful for free? Beats downloading a bunch of free apps anyday. 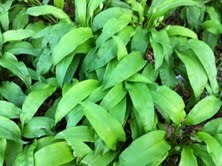 Nutrition Notes: As would be expected, wild garlic is over-burdened with plant chemical goodness. For all the positive health kudos that common garlic gets, its wild cousin should share the attention. Due to their high sulfur content, wild and common garlic are highly anti-microbial, raising white blood cell production and fending off bacteria, viruses, parasites and fungi. But the sulfur compounds are also excellent in helping prevent lung problems, heart disease and cancers such as stomach and colon. Wild garlic is a particularly good source of magnesium and manganese, for muscles (heart especially) and bones, respectively, but is also replete with Vitamin B6, iron, phosphorus, selenium and zinc. But the sulfur compounds are the focus of scientific attention, and with good reason. You might be wondering, why almonds rather than pine nuts? Well, pine nuts are delicious, and all nuts are nutritious, but almonds really are special and work wonderfully in this recipe. Almonds, especially the striated toasty-skinned ones, are a top source of natural Vitamin E , 24 mg per 100g, as well as being a good source of calcium, iron, magnesium, phosphorus, potassium (another great one for the heart) and top anti-oxidant, zinc. Some of you may balk at the calories but even though a 35 gram serving (1/4 cup) comes in at 200 calories, so much of it is filling protein and good fats that it’s a great snack that staves off hunger pangs and deliver nutritionally. Can you say that about a 400 calorie muffin or 150 calorie diet cereal bar? Exactly. And don’t worry about the fat – it’s all good, with inflammation-busting monounsaturated fats at the fore. Just hold off on the candy-coated nuts! If you are reading this in April and live near a stream, river or any flowing body of water there is really no excuse not to make this pesto. You don’t even have to have a food processor: hand-chopped pesto is actually more authentic and visually appealing. First of all make up the pesto by blending the leaves and almonds until a coarse paste, then add the cheese and lemon juice and zest. Gradually pour in the oil, taste the pesto and add honey and salt to taste. 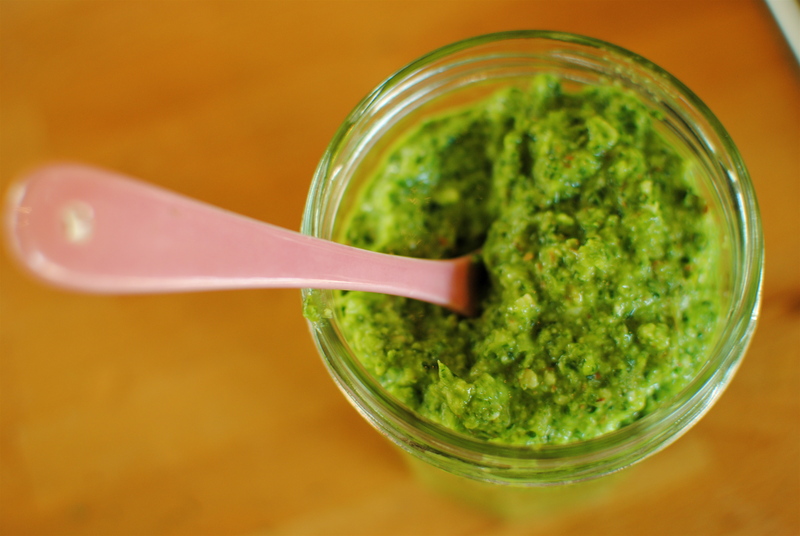 My recipe calls for less oil than is traditional so add more if you want a ‘looser’ pesto. If you don’t have a food processor, or similar, take a large chopping board and a large-bladed heavy knife and start by chopping the leaves, then adding the almonds on top (this keeps them from sliding around) and chopping very finely. Chop in the grated cheese too, using the knife to slide under and shift the developing paste for even chopping. Pop the paste into a bowl and stir in the lemon juice, zest and oil with a fork, adding in honey and salt to taste. This makes enough for a little under two 200g jars so use some for the risotto and put the rest into two sterilised jars, top with oil and keep in the fridge for up to three weeks. It also freezes very well in a suitable container. For the risotto itself, heat a large-ish saucepan on low and melt the butter with the oil. You can use all oil but it does really seem to taste better with just a touch of butter. Keep the stock hot and barely simmering in a separate pan; you will use this to ‘feed’ the risotto in a wee moment. Finely chop the onion or shallots and sauté in the oil-butter with a small pinch of salt for five minutes, until soft and golden. The salt will help prevent burning but still give it an occasional stir. Now add in the rice and thyme leaves, stirring to completely coat. Keep stirring for another minute or so then pour in the wine and let this evaporate before adding a ladle of stock. Give it a stir occasionally as the stock evaporates. Before it completely evaporates and the rice begins to stick add in another ladle of stock and continue stirring and ladling for about 20-25 minutes. I probably feed it every three minutes but I haven’t actually counted. At about this time the rice should be cooked ‘al dente’ – to the tooth. What you are after is rice that still has a bit of bite to it and that is on the soupy side, so add a little more stock if the risotto is too ‘ricelike’. Although a firmish texture is authentic do cook it a bit longer in the stock if you want it soft, but be warned that the rice goes mushy as it continues to cook. Thank you lovely staff at Cocoa Tree Cafe in stunning Pittenweem, Fife. Your chocolate cake and decaf Americano was just the thing to keep me going, as well as the free wi-fi. Husband still buzzing from your specialty “caliente’ hot chocolate. Thanks Kellie for the tips on where to “snip” the leaves. I live right next to the water of Leith so I’m going armed with my scissors as soon as ……. I used to grow wild garlic in Netherlands in my allotment. 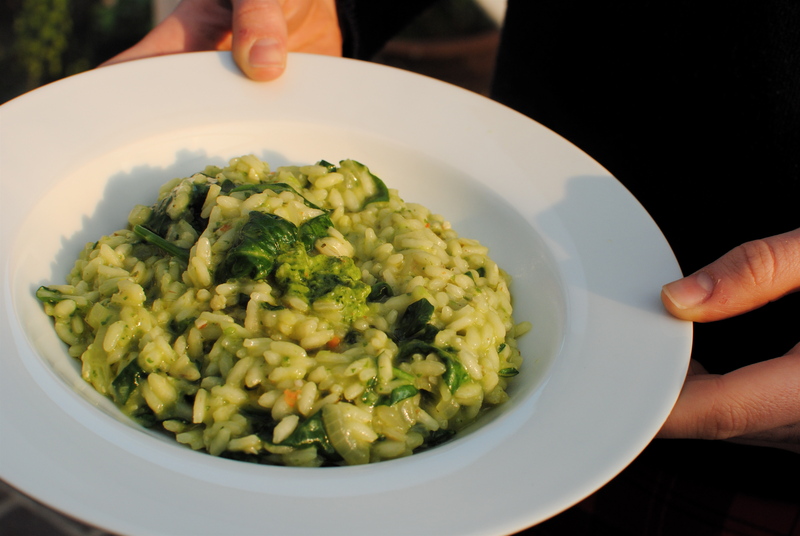 Thanks also for the lovely recipe – I love Risotto. The pickings should still be good. A bit wet today though! I’m reading this on a cool August day 6 years later! (Been hopping around your recipes after today’s post of Vegetable Parmesan Low-Carb Bake). I moved up here to West Yorkshire from London 4 years ago and am now well into the foraging thing, which all started when I discovered an abundance of Wild Garlic just up the hill when I was doing toad rescue in my first Spring here. I always feel ‘flat’ once the plant has well and truly gone over, it signifies the passing of one of the Rites of Spring. But I persevere to the bitter end, harvesting the seeds to sprinkle over salads and cook into stir-fries – they certainly pack a punch! The stems are the nearest I can find to Japanese ‘NIra’ which is a common stir-fry ingredient in Japan. The flowers look very pretty arranged on a green salad. But my lasting favourite use is in the indescribably delicious Kellie Andersen Veggie Cake (aka Savoury Spinach, Wild garlic, Nettle & Porcini Cake)! It’s a firm favourite with my partner and I, especially for packing into a picnic on one of our many walks in this stunning landscape. And it doesn’t end in Spring. The Wild Garlic may be gone, but there is still spinach, garlic and other greens (though not foraged as they get tough at this time of year) so we can enjoy this cake all year round. Thank you for your ever-inspiring, healthy and delicious recipes.